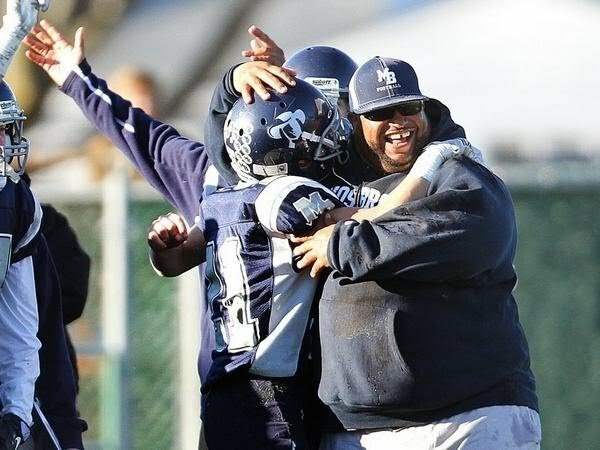 Brown University assistant coach Willie Edwards has been involved with high school football since 1990 when he joined the Deering Middle School football team of West Warwick, Rhode Island. Edwards was a stand out running back at West Warwick High School. After high school, he took a post-grad year at Kent School in Kent, Connecticut. Edwards was working on building his stock to play NCAA Division I football. Following his lone year at Kent, Willie received a scholarship from the University of Rhode Island. After a couple of seasons at URI, Edwards would transfer again to Merrimack College in North Andover, Massachusetts. Edwards had other offers but stayed close to home so he could be near his daughter. Edwards would never get his degree from URI or Merrimack College. The death of an old friend weighed heavily on him and steered him away from his path for a few years. Edwards’s role would be as a leader to the student-athletes in his community, he just didn’t know it yet. Edwards was living with a family that had ties with Johnson and Wales University in Providence, Rhode Island. When the time was right, Willie went back to school at JWU and received his college degree. In the spring of 2005, Edwards would run into an old teammate from URI, La John Jones. Jones was the head football coach at a small, private Division IV high school in Providence, Moses Brown. Jones brought Edwards on as a voluntary assistant coach and started a historic run with Moses Brown Quakers football. “As a volunteer, I helped coach running backs, linebackers and junior varsity, pretty soon when I became a paid coach I really started helping with the offense,” Edwards said. In April 2011, athletic director Jeff Maidment approached Edwards and asked him to look into the then-vacant head coaching position at Moses Brown. “I didn’t really even interview for the job, Jeff told me to put in for it and since he was the guy choosing the next coach I felt pretty confident,” Edwards said. Edwards’s first year was far from perfect. Moses Brown finished 5-4 and the Quakers missed the playoffs for the first time. Edwards found that mentor in the late coaching legend Karlin Lynch from Dartmouth High School. During the 2012 season, Edwards started making the football program his own. He instituted the ‘Breakfast Club,’ a morning workout session for the Moses Brown football players. In 2013 Edwards brought in a new defensive coordinator, Joe Ucci. Ucci’s twin brother, Vin, was already on Edwards’s staff, and the combo made a dynamic coaching pair. The program was indeed on the rise. Quaker football would move from Division IV in 2005, all the way up to Division I in 2018. Along the way, the Quakers would make five state Super Bowl appearances with two Super Bowl titles. The All-State teams would be filled with Quakers, and some of them would go on to play football in college. Former Quakers Michael Walsh and Jayden Pena are the latest to head to college football, as each has committed to Brown University and Tufts University respectively. Both players made the Rhode Island All-State team under the tutelage of Edwards. Brown University was 1-9 in 2018 and has recently hired former Bryant University coach James Perry. Edwards is set to join Perry and the Bears for the upcoming football season this fall.